Come back drunk from dinner, which to read, which to read? I’ve read both Imogen Binnie’s Nevada and the Cat in the Hat in Latin so many times! 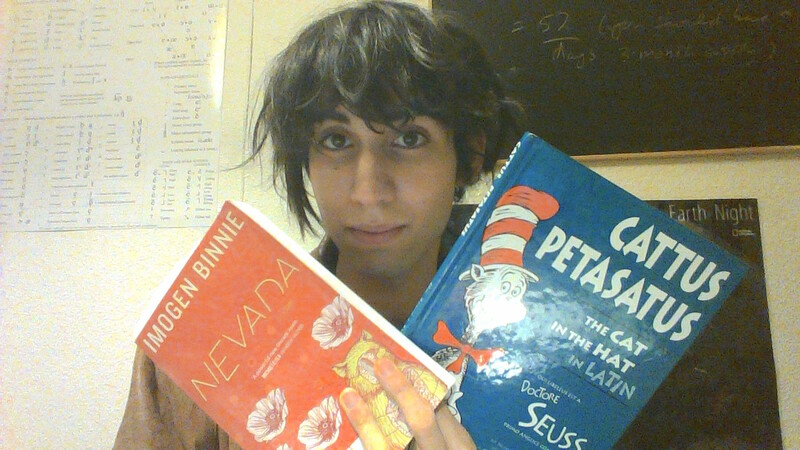 The obvious solution is to brush up my Latin by rereading The Cat in the Hat and then annotate Nevada with extensive Pierre-de-Fermat-esque marginalia: “I could prove you’re not an ‘autogynephiliac,’ James H., but first I have to feed my imaginary cat.” Posso tuum tamquam puella non te places probare, Iacobe H., sed primo habeo felem imaginariam meam alere. Wikipedia’s list of English prefixes categorize trans- and cis- differently. Trans- is “native”. That is, it comes to us through Medieval French and has been fully integrated (linguists would call it productive) into modern English. Cis- in “neo-Classical.” Meaning, it was lifted from Classical Latin into the modern age thanks to science, and now forms words like cislunar and cisgender. So, based on this incredibly complicated, complex analysis I decree that being transgender is more natural and native to anglophones than being cisgender is. Amen. Also interesting. A 5 min video. Muxe, a third gender group in southern Mexico.